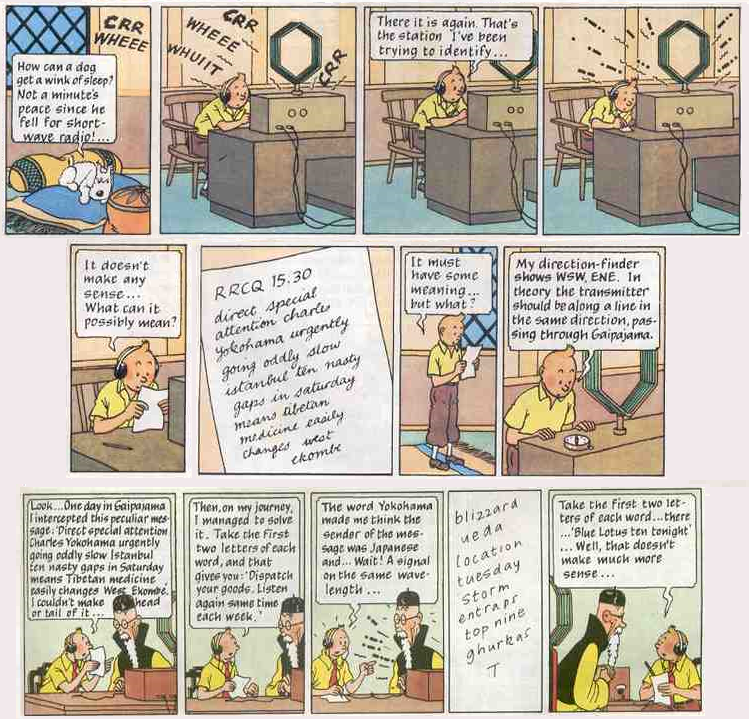 Hergé wrote that strip (in French) for the Belgian newspaper in 1934 or 1935 just after the Japanese invaded China and blew up the Manchurian Railway. Tintin is picking up Japanese transmissions to/from spies in China in Morse. The Japanese lodged a protest with the Belgian Embassy after it was published! It was later coloured and published in English as “The Blue Lotus”. You can buy the full story in most bookshops and online. The Hergé will be a one valve regenerative Radio running off batteries (3x PP3 = 22.5 / 27V, 6x PP3 = 45V/54V or 8 x PP3 = 60V/72V ). Optionally a second 1j18b can be added as an audio amplifier, especially valuable if you want to use 27V. You can even use 2 x PP3 (16V to 18V) if you add and amplifier. The valves (or Tubes) used are Russian Sub-Miniature Rod Pentodes made entirely for Military use. Also you can add a 3 x 1j18b Headphone amplifier for ordinary 32 Ohm “player” ‘phones (18V to 45V, 3 x AA cell LT) or an amplifier with 2 x 1j18b and 1j29b for a loudspeaker (45V to 90V). You can wire it for LW, MW or SW, or fit a switch for two bands or more. Unusually much of the wiring will use plastic screw terminal blocks. The actual radio “front” is regenerative Tuned Radio Frequency (TRF), The regenerative feedback (using coil labelled Yellow & Blue) cancels out losses in the tuning circuit thus making the tuning sharper and signal stronger. Too much feedback and the circuit is a small MW transmitter! Early version of radio. Current version is a little different. Basic concept. It’s using a valve made in 1980s that was designed in mid 1950s. The latter half 1950s Battery portable radio sets used a loop aerial in the lid. They used 125mA LT 1.5V and about 6.5mA HT from 90V pack. Line up filament Heptode frequency changer / oscillator / mixer. From 1954.”>filament Heptode frequency changer / oscillator / mixer. From 1954.”>DK96, filament direct oxide cathode. Replaced earlier 1T4 / DF91″>filament direct oxide cathode. Replaced earlier 1T4 / DF91″>DF96, DAF96 and DL96. Usually LW & MW. The earlier 1950s and late 1940s miniature valve sets used filament direct oxide cathode. Equivalent with RCA 1T4. Replaced by 25mA DF96 “>filament direct oxide cathode. Equivalent with RCA 1T4. Replaced by 25mA DF96 “>DF91 which is twice the filament current. They had more variation of valves and design and up to 250mA LT 1.5V current.